CAIRO (AP) — On the Giza Plateau outside Cairo, thousands of Egyptians are laboring in the shadow of the pyramids to erect a monument worthy of the pharaohs. 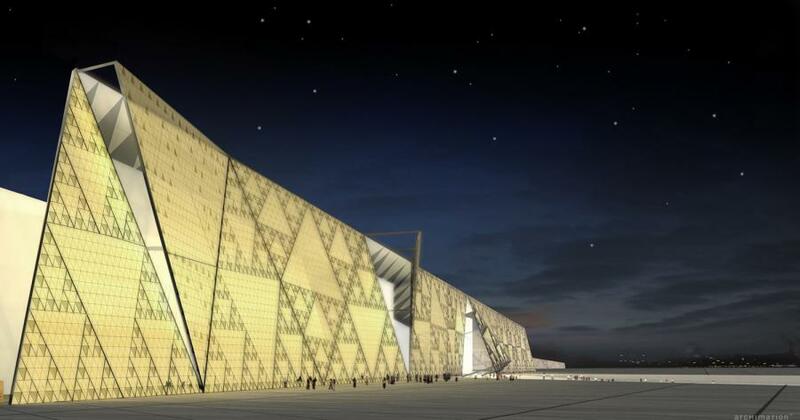 The Grand Egyptian Museum has been under construction for well over a decade and is intended to showcase Egypt's ancient treasures while drawing tourists to help fund its future development. But the project has been subject to repeated delays, with a "soft opening" planned for next year scrapped in favor of a more triumphant inauguration in 2020. Costs have meanwhile soared from an initial $650 million to well over $1 billion, with most of the financing coming from Japan. It's the latest mega-project to be championed by President Abdel-Fattah el-Sissi, who is wagering that massive investments in infrastructure will revive an economy weakened by decades of stagnation and battered by the unrest that followed the 2011 uprising. The museum is a series of towering concrete halls that will eventually hold some 50,000 artifacts, including the famed mask of Tutankhamen — popularly known as King Tut — and other treasures currently housed in the century-old Egyptian Museum in Cairo's congested Tahrir Square. The hope is that tourists will stay awhile, and provide the foreign currency Egypt needs to buttress its economy. "It's a place where you can linger to enjoy ancient Egypt," project director Tarek Tawfik said on a recent tour of the site, which will also include a conference center, a cinema, 28 shops, 10 restaurants and a boutique hotel. Giant windows open onto the 5,000-year-old pyramids, and the museum will feature an intact wooden ship and a towering statue of Ramses II. Tawfik describes it as "a fantastic experience of ancient Egypt in a very modern building that provides all kind of modern, comfortable functions." That would mark a major change from the current setup, in which tourists visiting the pyramids and the Sphinx are routinely hassled by touts and camel-drivers. Tourists are gradually returning to Egypt, but the industry has yet to recover from the 2011 uprising, which toppled longtime autocrat Hosni Mubarak and ushered in a period of instability, culminating in the military overthrow of the country's first freely elected president, an Islamist whose brief rule sparked mass protests. El-Sissi, who led the overthrow of Mohammed Morsi in 2013 and was elected the following year, has presided over an unprecedented crackdown on dissent. Political demonstrations, heavily restricted under a 2013 law, are now unheard of. A Sinai-based insurgency that gathered steam after Morsi's overthrow has carried out a series of attacks in recent years, mainly on security forces and Christians, but has only rarely targeted foreign tourists. El-Sissi has meanwhile sought to use large-scale projects to bolster the image of the state — with mixed results. A trumpeted expansion of the Suez Canal in 2015 has yet to deliver the soaring revenues the government promised, as global trade has eased. A grandiose new administrative capital under construction outside Cairo is still in the early stages, with negligible foreign investment and foreign embassies not keen to move so far out into the desert. Egypt's pharaonic heritage remains a major draw, however, and Tawfik expects the museum to attract 8 million people a year once it opens. An estimated 8 million tourists will have visited Egypt in 2018, an increase from previous years but well below a peak of 14.7 million before the 2011 uprising. Egypt's multi-national construction giant Orascom built the museum, with initial loans from the Japanese government of $320 million in 2006 and $450 million in 2016. The Japanese continue to advise on the museum's development and artifact restoration, but it is unclear who will provide the additional financing for the project, with costs now estimated at $1.1 billion. A bidding process is underway to find someone to operate the site. Much of the financing may end up coming from the military or affiliated companies, which play a major role in the economy and have been heavily involved in other mega-projects. The Associated Press spent several weeks seeking permission to visit the museum, which was ultimately granted by the military. Tawfik said the military is helping with "value engineering" — the sourcing of local components like stone cladding and materials to reduce reliance on more expensive imports. Egypt floated its currency in 2016 in order to secure a bailout from the International Monetary Fund, leading to a devaluation that has taken a heavy toll on poor and middle-class Egyptians. "Today, despite all the increases in costs and the floating of the Egyptian pound, it's quite amazing that the project will be completed, thanks to good management and value engineering," he said.